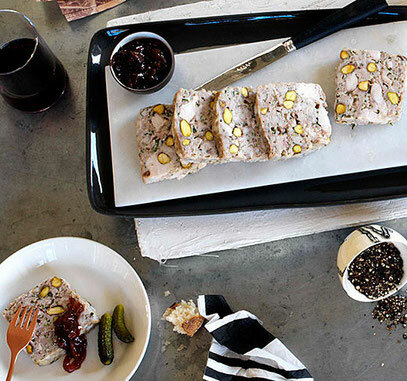 Country Terrine of Pork, Chicken and Pistachios . . .
1. Combine all ingredients except caul, chutney, cornichons and bread in a large bowl, working well with a large wooden spoon (5 minutes). Season to taste with 1 tbsp sea salt and freshly ground white pepper. 2. Preheat oven to 220C. Line a 30cm-rectangular terrine mould or loaf tin with caul, allowing it to overhang the sides, and fill with pork mixture. Fold the caul over and tuck it along the sides so the top of the terrine has no joins and is completely sealed. Cover mould. Place in a roasting pan, fill with enough hot water to come halfway up sides of mould, transfer to oven and cook for 15 minutes. Reduce oven to 140C and cook until a meat thermometer inserted into the centre reads 72C (1-1½ hours). Cool to room temperature, then refrigerate overnight. 3. Remove terrine from mould (you may need to warm the mould by dipping it into a warm water bath first). Clean jelly and residual fat from the outside with absorbent paper, thinly slice and serve with chutney, cornichons and crusty bread.